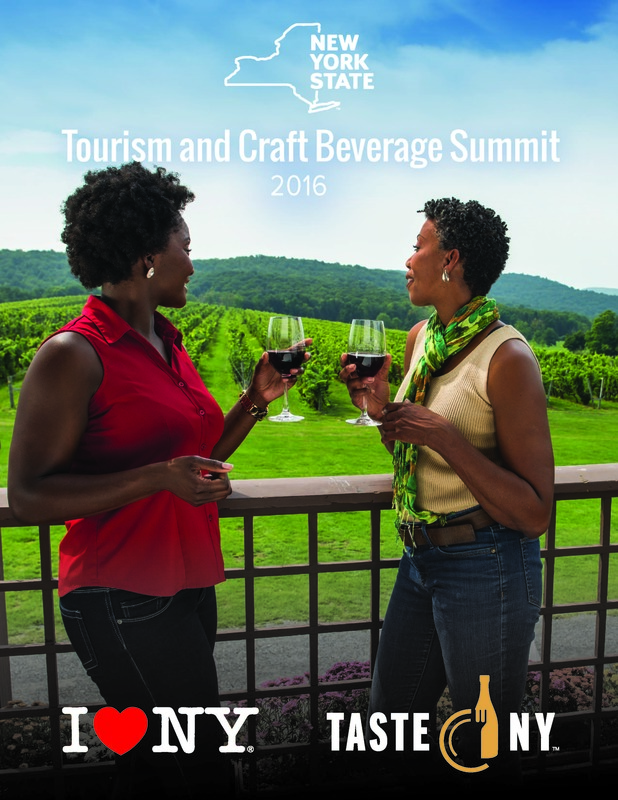 On October 18, 2016, Governor Andrew M. Cuomo hosted the New York State Tourism and Craft Beverage Summit, where leaders in the tourism and craft beverage industries met with state officials to explore new industry opportunities. At the summit, the state&apos;s largest investment in tourism to date was unveiled - an unprecedented $55 million dedicated to promoting New York&apos;s world-class attractions, drawing more visitors, creating jobs and further growing the industry throughout the Empire State. Initiatives announced at the event include new welcome centers in every region of the state that will feature Taste NY markets and offer locally-grown produce, and an additional $2 million in funding to promote special events specifically related to agritourism and the craft beverage industry. These announcements build on the administration&apos;s historic investments in tourism and highlight the successful series of Tourism and Wine, Beer and Spirits summits held in Albany since 2013. "Our investments in the tourism industry have paid dividends in every region and with this unprecedented $55 million, we are keeping the momentum moving forward," Governor Cuomo said. "With new welcome centers that will serve as gateways to New York&apos;s unparalleled natural beauty, and with this new funding, we are creating an interactive tourism experience that will keep visitors coming back year after year. This summit builds on our administration&apos;s commitment to tourism and helped to foster innovative ways to leverage our natural assets, attract more visitors and garner economic activity across this great state." "As chair of the Regional Economic Development Councils, I have traveled to every corner of the state and have seen first-hand the economic benefits of investing in the tourism industry, which has now become our fourth largest employment sector," said Lieutenant Governor Kathy Hochul. "Coupled with that success is the seemingly exponential growth in the number of wineries, breweries, distilleries and cideries, which not only bring jobs and tax revenue, but also serve as major tourism drivers. By bringing together tourism, agritourism and craft beverage leaders, we will streamline success and allow these industries to continue to flourish in New York State." "Since taking office, Governor Cuomo has never wavered in his commitment to investing in tourism, and the results have been tremendous," Empire State Development President, CEO & Commissioner Howard Zemsky said. "Each year, we are seeing more visitors traveling to New York State generating 894,000 jobs and more than $63 billion in direct spending in our communities." "I&apos;m proud of the impact Taste NY has had on not only promoting our growing food and beverage industry and their innovative producers, but also boosting the State&apos;s tourism economy," State Agriculture Commissioner Richard A. Ball said. "As more consumers turn to local products for fresh, healthy and unique varieties, they&apos;re looking to explore the State&apos;s farms, food and craft beverage businesses behind these new favorites, sparking a renewed interest in agritourism." "New York&apos;s resurgence in craft manufacturing took off following the Governor&apos;s first Wine, Beer and Spirits Summit and continues to grow and thrive today," State Liquor Authority Chairman Vincent Bradley said. "By modernizing the law, implementing regulatory reform and business friendly policies, New York craft manufacturers continue to draw tourists and provide a positive economic impact throughout the state." The event brought together hundreds of tourism and craft beverage experts to discuss new approaches and strategies to increase visitation across the state&apos;s 11 vacation regions. Several topical breakout sessions were held in the afternoon on vital tourism industry market segments. Based on the input of key stakeholders, the Cuomo administration unveiled several new statewide initiatives to build upon the success of previous summit projects. These new ventures will build on the Governor&apos;s commitment to promote New York State as the tourism capital of the world. I LOVE NY @TRIBECA: A new I LOVE NY @Tribeca short film competition will invite film students from across the state to submit ideas for a tourism-based video themed around New York&apos;s vacation regions. One idea for each of the eleven tourism regions will be chosen to be produced. A panel of celebrity judges, including Steve Buscemi, will award the best of the final videos.ý The program has the support of Tribeca Film Festival co-founders Robert De Niro and Jane Rosenthal. Winners of the competition will be announced during the 2017 Tribeca Film Festival. HERITAGE TOURISM: New York State will celebrate two landmark anniversaries in 2017: 100 years of women&apos;s suffrage in New York, and the 200th anniversary of the Erie Canal. These events will be commemorated with a pair of integrated Path Through History promotions. Visitors will be led to attractions and events commemorating the work of suffragettes who helped New York become the first eastern state to grant women the right to vote, and the importance the Erie Canal played in building New York&apos;s industry and trade. ENHANCED I LOVE NEW YORK APP: The official I LOVE NEW YORK app has already proven to be very popular as the #1 destination marketing organization app in the App Store. The app will be expanded with a new audio tour feature where users will be able to download narrated walking and driving tours featuring top New York State attractions. The tours will feature a live map, walking and driving directions, and immersive multimedia content. Visitors will be encouraged to snap photos at each stop on the tour through integration with the phone or tablet camera, and to share them through social media and email. ACCESSIBLE TOURISM: New York State wants to be sure that anyone, regardless of physical limitations, disabilities or age, can enjoy its world-class attractions and events. By launching a new initiative to welcome these travelers, New York State can reach out to this $17.3 billion market. Plans include expanded accessibility information that will be available to travelers on the official I LOVE NEW YORK app and website, and providing technical assistance training to Tourism Promotion Agents and destinations. MARKET NY: Funding for the Market NY program will increase to $15 million with $2 million allocated specifically on agritourism and the craft beverage industry. The new round of tourism grants will be dedicated to promoting destinations, attractions and special events focused on craft beverages and agritourism. The grants will include funding for advertising, media production costs, industry-related press tours and marketing materials, along with website design, development and updates. INCREASED TASTE NY EXPOSURE: Taste NY&apos;s presence at the 2013 PGA Championship at Rochester&apos;s Oak Hill Country Club led to increased tourism at farm-based craft beverage operators. To capitalize on this, $500,000 will be allocated for a new special events agritourism marketing initiative. Using these funds, Taste NY will have a presence at key events and festivals, targeting audiences who are receptive to visiting craft breweries, wineries and other agritourism destinations across New York State. Senator Patty Ritchie, Chair of the Senate Committee on Agriculture said, "When it comes to the craft beverage industry, good-tasting, locally produced wines, beers, spirits and cider are just the tip of the iceberg. This rapidly growing industry encourages the growth of New York&apos;s agriculture and tourism industries, as well as creates jobs and boosts local economies statewide. I have been pleased to advocate for funding to support craft beverage producers and would like to thank the Governor and Commissioner Ball for recognizing how much potential the industry has for growth in the future." Senator Rich Funke, Chair of the Senate Committee on Tourism said, "The tourism and craft beverage industries are booming here at home in the Finger Lakes Region and all across New York State. As, it&apos;s always great to hear from the experts in the field who are working to attract visitors, jobs, and investment to our state every day. My thanks to Governor Cuomo for hosting today&apos;s summit." Senator Betty Little said, "The tourism and craft beverage industries have been experiencing tremendous growth across the state, which is creating new jobs while strengthening local economies and our communities. I thank Governor Cuomo for his continued support for growing and promoting these industries, particularly in Upstate New York." Assemblyman Bill Magee, Chair of the Assembly Committee on Agriculture said, "I have witnessed the blending of agriculture and tourism in my district. The success of the craft food and beverage movement has brought renewed interest in farming, and farmers are opening their doors to the public. Agritourism is rejuvenating upstate farmlands and businesses and has become a major contributor to our upstate economy." Assemblywoman Margaret Markey, Chair of the Assembly Committee on Tourism, Parks, Arts and Sports Development, said, "It is great news that Governor Cuomo continues to expand funding for initiatives to promote tourism and New York State agricultural and food products. Year after year, we have attracted new visitors to enjoy the wonders of our state and watched it pay off in new jobs and local and regional economic growth." Governor Cuomo&apos;s steadfast support for boosting tourism has resulted in industry-wide growth, including visitors, jobs and revenue. Today&apos;s announcement is a $5 million increase from 2015 and represents one of the nation&apos;s largest state investments in tourism. New York State has benefitted tremendously from these investments, with total economic impact increasing by more than 25 percent since 2010. For the second straight year, the tourism industry&apos;s total economic impact eclipsed $100 billion, growing to a record $102 billion in 2015. Last year alone, New York welcomed 234 million visitors who brought more than $63 billion in direct spending. Governor Cuomo&apos;s $150 million investment has returned an additional $9 billion increase in direct visitor spending to $63 billion. The craft beverage industry has experienced unprecedented growth under the guidance and direction of Governor Cuomo, who has approved several measures and implemented significant reforms to promote and expand the industry. New York State is now home to more than 900 wineries, breweries, distilleries and cideries. The number of farm wineries in New York has increased by more than 60 percent, from 195 in 2010 to 316 today. Additionally, the number of microbreweries has grown by 285 percent, from 40 in 2010 to 154, while the number of farm distilleries grew from just 10 in 2010 to 98 today. Farm-based craft beverage producers have grown by 178 percent since 2011, from 205 to 570 manufacturers.